As you start sending higher volumes of mail with Lob, you may have a need to analyze the status and deliverability of your mail on a more aggregate basis. 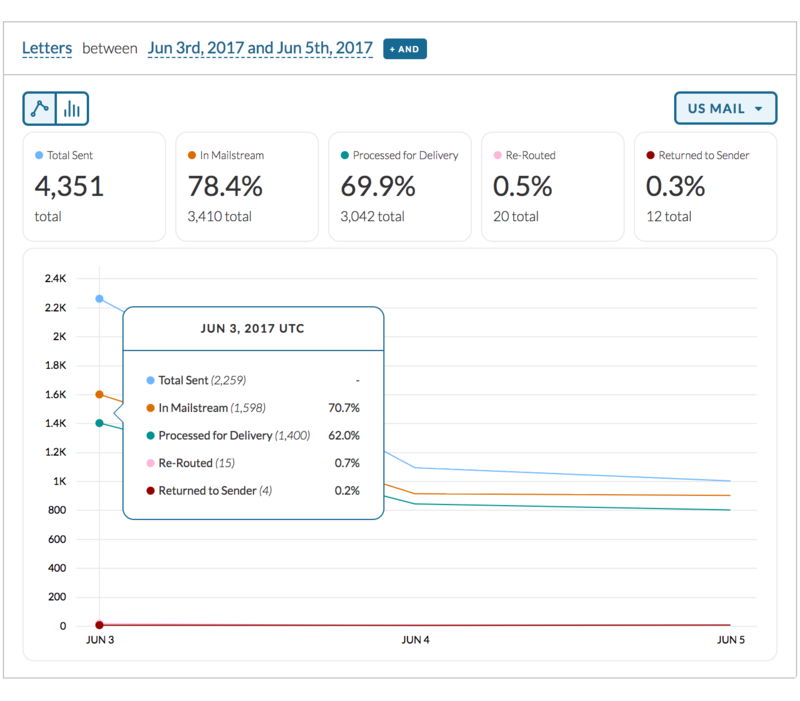 Our Mail Analytics Dashboard gives you full visibility into where the mail you've sent in any given time period sits in the mail stream. You can slice and dice your data by certain filters to view a full deliverability report, all directly from your Dashboard. To access this feature, sign in to your Dashboard and click the "Mail Analytics" tab in the left navigation bar. Sent: This is a count of non-deleted mailings that you have sent to Lob in the specified time frame based on the date for which a piece was scheduled (the piece's send_date), not the date the API request was made. In Mailstream: This bucket is an aggregate of two tracking events, In Transit and In Local Area. These are the first two scans that a piece will receive—representing that it's in the mailstream and on the way to its destination. Processed for Delivery: This bucket is represents pieces that have received a Processed for Delivery scan. This scan means that the piece has been greenlit for delivery at the destination's nearest postal facility and will likely be delivered in 1-2 business days. Re-Routed: If a piece is re-routed due to recipient change of address, address errors, or USPS relabeling of barcode/ID tag area, it will receive this scan. Returned to Sender: A piece will receive a Returned to Sender scan if delivery was attempted, but failed due to barcode, ID tag area, or address errors. Then it will be counted once in the "Sent", "In Mailstream", and "Processed for Delivery" buckets. NOTE: Certified and Registered letters and Overnight checks are excluded from this dashboard because they are tracked via their own external tracking numbers. On your Mail Analytics Dashboard, you can slice-and-dice your data by various other aspects of your mailings, including: product type, recipient ZIP code, template used, and more. You can use these filters to compare deliverability between your different campaigns, recipients, and more. Be sure to leverage Lob's metadata feature to more deeply tag your Lob mailings with any internal data you may have, such as a customer ID or campaign ID. Then, you can easily filter by that metadata within the Analytics Dashboard to view different deliverability reports based on those factors. For mail sent to international destinations, we only expect to get either "In Transit" or "In Local Area" scans. For this reason, we've added a top level filter where you can compare US and international mailings, with the last three tracking buckets disabled for international mail. 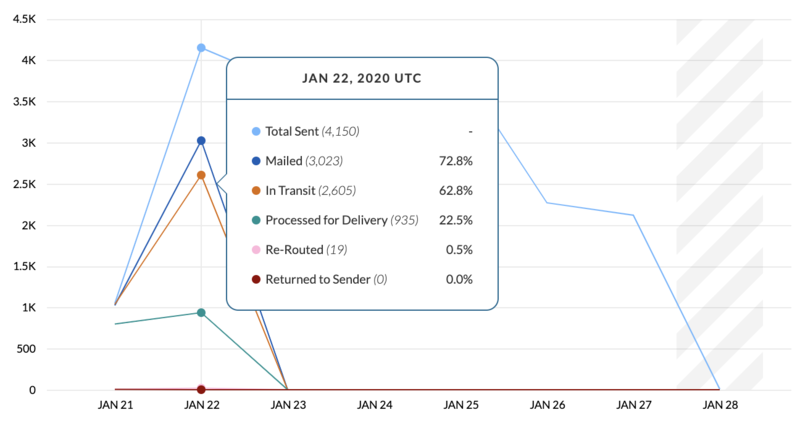 Under the tracking event statistics on the dashboard, we also provide a graph that provides an even further breakdown of your mail by day, week, or month. Time periods are grouped by the date a piece was sent, not by the date of the API request. As with all other dates within the Lob system, the UTC time zone is used. Hover over a specific column to view a full tracking breakdown for that time period. Use this breakdown to narrow down your data for even further analysis. Over time, you can expect to see tracking events for 98-100% of your mailings. The numbers below are benchmarks for when you should start seeing scans. Keep in mind that these timings and percentages may vary based on the volume of mail you've sent, where you're sending to, and the quality of your address set. For first class mail, you'll start to see mailings reach the "In Mailstream" bucket in 2-3 business days and the "Processed for Delivery" bucket 1 business day afterwards. After about 4 business days total, you should expect almost all of your mailings to be in the "In Mailstream" state. After about 5 business days total, almost all of your mailings should be in the "Processed for Delivery" state. For standard mail, which is inherently slower, the timing is a bit different. You'll start to see mailings reach the "In Mailstream" bucket in 4-5 business days and the "Processed for Delivery" bucket 2 business days afterwards. After about 10-11 business days total, you should expect almost all of your mailings to be in the "In Mailstream" state. After about 12-13 business days total, almost all of your mailings should be in the "Processed for Delivery" state.